the flexible blades on this side. 1. suction: The impeller rotation and the straightening of the vanes upon leaving the cam creates a vacuum on the suction side drawing the fluid into the pump chamber. 2. transfer: The rotating impeller transfers the liquid from the inlet to the outlet port of the pump. 3. Press: On the pressure side the impeller vanes are compressed and the fluid is discharged constantly from the pump. What makes impeller pumps outstanding – they do not need to be filled prior to operation. Impeller pumps are dry self priming from a depth of three meters. Pre-filling is required for suction depth of three metres and more. The suction depth is max. 7 metres. Useful for many different fluids and applications. Materials of impellers, seals and pump housings can be selected according to the individual needs and applications required. 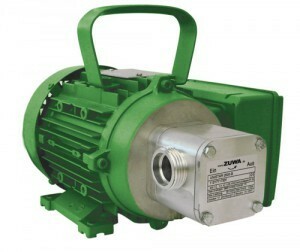 ZUWA Impeller Pumps are available with AC and DC motors with various revolutions per minute. All pumps are tested for continuous operation in our workshop. Top quality materials guarantee for a long durability. 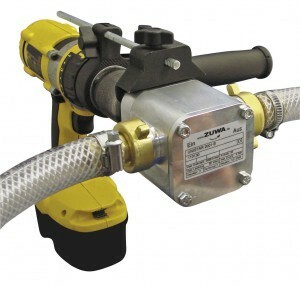 For cleaning and maintenance work the pumps are quickly and easily disassembled. Replacement parts can be ordered individually. Low operation costs!